For a few years, this party played a major role as a force in American politics. The People’s Party (also known as the Populist Party or the Populists) was an agrarian-populist political party in the United States. For a few years, from 1892 to 1896, it played a major role as a left-wing force in American politics. It was merged into the Democratic Party in 1896; a small independent remnant survived until 1908. It drew support from farmers in the West and South. It was highly critical of banks and railroads, and allied itself with the labor movement. Established in 1891, as a result of the Populist movement, the People’s Party reached its peak in the 1892 presidential election, when its ticket, composed of James B. Weaver and James G. Field, won 8.5% of the popular vote and carried five states (Colorado, Idaho, Kansas, Nevada and North Dakota), and the 1894 House of Representatives elections, when it took over 10% of the vote. Built on a coalition of poor, white cotton farmers in the South (especially North Carolina, Alabama and Texas) and hard-pressed wheat farmers in the Plains states (especially Kansas and Nebraska), the Populists represented a radical opposition to banks, landowners, local and Eastern elites, railroads, and the gold standard. 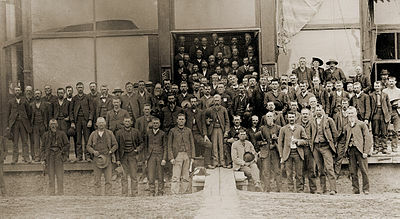 The party sometimes allied with labor unions in the North and Republicans in the South. In the 1896 presidential elections the Populists endorsed the Democratic presidential nominee, William Jennings Bryan, adding their own vice presidential nominee. By joining with the Democrats, the People’s Party lost its independent identity and rapidly withered away. A People’s Party grew out of a large mood of agrarian unrest in response to low agricultural prices in the South and the trans-Mississippi West, as well as thought that the “Eastern Elites” were taking advantage of the farmers by charging higher rates on loans and trains. The Farmers’ Alliance, formed in Lampasas, Texas, in 1876, promoted collective economic action by farmers and achieved widespread popularity in the South and Great Plains. The Farmers’ Alliance ultimately did not achieve its wider economic goals of collective economic action against brokers, railroads, and merchants, and many in the movement advocated for changes in national policy. By the late 1880s, the Alliance had developed a political agenda that called for regulation and reform in national politics, most notably an opposition to the gold standard to counter the high deflation in agricultural prices in relation to other goods such as farm implements. In 1886, an entirely different “People’s Party” elected 6 assemblymen to the Wisconsin State Assembly and 1 senator to the Wisconsin State Senate. However this was a labor party, and by the 1888 elections it was using the Union Labor Party label. In December 1888 the National Agricultural Wheel and the Southern Farmer’s Alliance met at Meridian, Mississippi, where the national farmers convention was held that year. In that meeting they decided to consolidate the two parties pending ratification. This consolidation gave the organization a new name, the Farmers and Laborers’ Union of America, and by 1889 the merger had been ratified, although there were conflicts between “conservative” Alliance men and “political” Wheelers in Texas and Arkansas, which delayed the unification in these states until 1890 and 1891 respectively. The merger eventually united white Southern Alliance and Wheel members, but it would not include African American members of agricultural organizations. Later in the year, the party held a national convention chaired by Frances Willard, leader of the WCTU and a friend of Powderly’s. 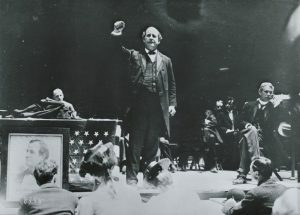 Meeting in Omaha, Nebraska, the party nominated a presidential ticket consisting of James B. Weaver and James G. Field. The party’s platform, commonly known as the Omaha Platform, called for the abolition of national banks, a graduated income tax, direct election of Senators, civil service reform, a working day of eight hours and Government control of all railroads, telegraphs, and telephones. In the 1892 presidential election, Weaver received 1,027,329 votes. Weaver carried four states (Colorado, Kansas, Idaho, and Nevada) and received electoral votes from Oregon and North Dakota as well. The party flourished most among farmers in the Southwest and Great Plains, as well as making significant gains in the South, where they faced an uphill battle given the firmly entrenched monopoly of the Democratic Party. Success was often obtained through electoral fusion, with the Democrats outside the South, but with alliances with the Republicans in Southern states like Alabama, North Carolina, Tennessee, and Texas. For example, in the elections of 1894, a coalition of Populists and Republicans led by Populist Marion Butler swept state and local offices in North Carolina, and the coalition would go on to elect Republican Daniel Lindsay Russell as governor in 1896. Quite separate from the Populists were the Silverites in the western mining states, who demanded Free silver to solve the Panic of 1893. By allowing the coining of silver coins, they hoped to make the value of the money more than what it represented, which would lead to inflation of the currency, and thus, reduce the debt of the farmers to the Eastern Elites. This idea led former Greenback Party members to join the Populist Party. The Populists followed the Prohibition Party in actively including women in their affairs. Some southern Populists, including Thomas E. Watson of Georgia, openly talked of the need for poor blacks and poor whites to set aside their racial differences in the name of shared economic self-interest. Regardless of these rhetoric appeals, however, racism did not evade the People’s Party. Prominent Populist Party leaders such as Marion Butler, a United States Senator from North Carolina, at least partially demonstrated a dedication to the cause of white supremacy, and there appears to have been some support for this viewpoint among the rank-and-file of the party’s membership. After 1900 Watson himself became an outspoken white supremacist and became the party’s presidential nominee in 1904 and 1908, winning 117,000 and 29,000 votes. By 1896, the Democratic Party took up many of the People’s Party’s causes at the national level, and the party began to fade from national prominence. In that year’s presidential election, the Democrats nominated William Jennings Bryan, who focused on the free silver issue as a solution to the economic depression and the maldistribution of power. 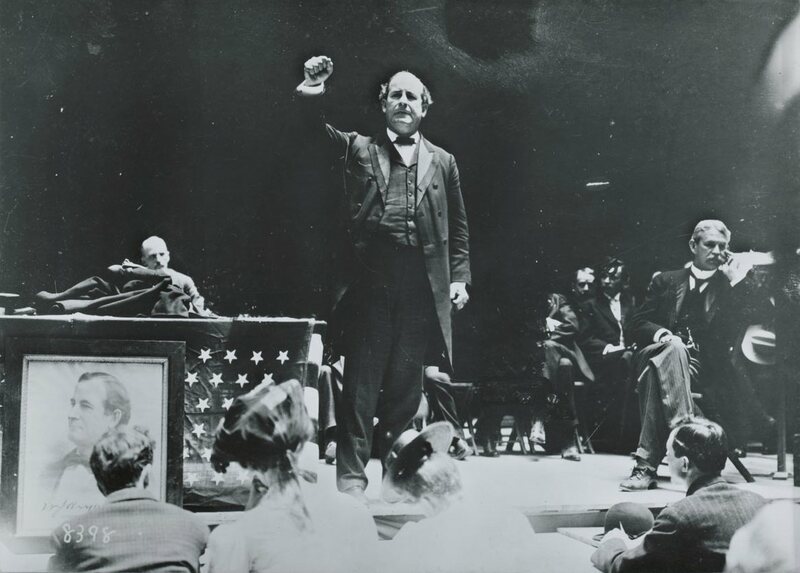 One of the great orators of the day, Bryan generated enormous excitement among Democrats with his “Cross of Gold” speech, and appeared in the middle of 1896 to have a good chance of winning the election, if the Populists voted for him. In 1894-96 the Populist wave of agrarian unrest swept through the cotton and tobacco regions of the South. The most dramatic impact came in North Carolina, where the poor white farmers who comprised the Populist party formed a working coalition with the Republican Party, then largely controlled by blacks in the low country, and poor whites in the mountain districts. 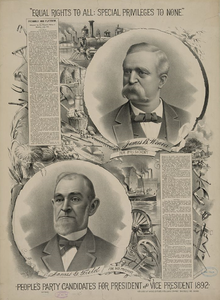 They took control of the state legislature in both 1894 and 1896, and the governorship in 1896. Restrictive rules on voting were repealed. In 1895 the legislature rewarded its black allies with patronage, naming 300 black magistrates in eastern districts, as well as deputy sheriffs and city policemen. They also received some federal patronage from the coalition congressman, and state patronage from the governor. The Populist movement never recovered from the failure of 1896, and national fusion with the Democrats proved disastrous to the party in the South. National alliance with the Democrats sapped the ability of the Populists to fight the Democrats locally in the South. Early on, this was less of an issue in the Western states where Republicans were strong, as the Democratic-Populist alliance was a more natural fit there, but eventually ended the party. In North Carolina, the state Democratic-party orchestrated propaganda campaign in newspapers across the state, and created a brutal and violent white supremacy election campaign to defeat the North Carolina Populists and GOP, the Fusionist revolt in North Carolina collapsed in 1898, and white Democrats returned to power. The gravity of the crisis was underscored by a major race riot in Wilmington, in 1898, two days after the election. Knowing they had just retaken control of the state legislature, the Democrats were confident they could not be overcome. They attacked and overcame the Fusionists; mobs roamed the black neighborhoods, shooting, killing, burning buildings, and making a special target of the black newspaper. There were no further insurgencies in any Southern states involving a successful black coalition at the state level. By 1900, the gains of the populist-Republican coalition were reversed, and the Democrats ushered in disfranchisement: practically all blacks lost their vote. The Populist/Republican alliance which had governed North Carolina, the only state in which it had any success, fell apart. Tennessee’s Populist Party was demoralized by a diminishing membership, and puzzled and split by the dilemma of whether to fight the state-level enemy (the Democrats) or the national foe (the Republicans and Wall Street). By 1900 the People’s Party of Tennessee was a shadow of what it once was. A similar pattern was repeated elsewhere throughout the South, where the Populist Party had previously sought alliances with the Republican Party against the dominant state Democrats, including in Watson’s Georgia. In 1900, while many Populist voters supported Bryan again, the weakened party nominated a separate ticket of Wharton Barker and Ignatius L. Donnelly, and disbanded afterwards. Populist activists either retired from politics, joined a major party, or followed Eugene Debs into his new Socialist Party. 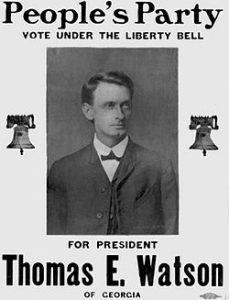 In 1904, the party was re-organized, and Thomas E. Watson was their nominee for president in 1904 and in 1908, after which the party disbanded again. In A Preface to Politics, published in 1913, Walter Lippmann wrote, “As I write, a convention of the Populist Party has just taken place. Eight delegates attended the meeting, which was held in a parlor.” This may record the last gasp of the party organization. Since the 1890s historians have vigorously debated the nature of Populism. Some historians see a close link between the Populists of the 1890s and the progressives of 1900-1912, but most of the leading progressives (except Bryan himself) fiercely opposed Populism. For example, Theodore Roosevelt, George W. Norris, Robert La Follette Sr., William Allen White and Woodrow Wilson all strongly opposed Populism. It is debated whether any Populist ideas made their way into the Democratic party during the New Deal era. The New Deal farm programs were designed by experts (like Henry Wallace) who had nothing to do with Populism. Some historians see the populists as forward-looking liberal reformers. Others view them as reactionaries trying to recapture an idyllic and utopian past. For some they were radicals out to restructure American life, and for others they were economically hard-pressed agrarians seeking government relief. Much recent scholarship emphasizes Populism’s debt to early American republicanism. Clanton (1991) stresses that Populism was “the last significant expression of an old radical tradition that derived from Enlightenment sources that had been filtered through a political tradition that bore the distinct imprint of Jeffersonian, Jacksonian, and Lincolnian democracy.” This tradition emphasized human rights over the cash nexus of the Gilded Age’s dominant ideology. The Farmers’ Alliance and the Populist demand for government ownership of the railroad is a phase of the same effort of the pioneer farmer, on his latest frontier. The proposals have taken increasing proportions in each region of Western Advance. Taken as a whole, Populism is a manifestation of the old pioneer ideals of the native American, with the added element of increasing readiness to utilize the national government to effect its ends. The most influential Turner student of Populism was John D. Hicks, who emphasized economic pragmatism over ideals, presenting Populism as interest group politics, with have-nots demanding their fair share of America’s wealth which was being leeched off by nonproductive speculators. Hicks emphasized the drought that ruined so many Kansas farmers, but also pointed to financial manipulations, deflation in prices caused by the gold standard, high interest rates, mortgage foreclosures, and high railroad rates. Corruption accounted for such outrages and Populists presented popular control of government as the solution, a point that later students of republicanism emphasized. In the 1930s C. Vann Woodward stressed the southern base, seeing the possibility of a black-and-white coalition of poor against the overbearing rich. Georgia politician Tom Watson served as Woodward’s hero. In the 1950s, however, scholars such as Richard Hofstadter portrayed the Populist movement as an irrational response of backward-looking farmers to the challenges of modernity. He discounted third party links to Progressivism and argued that Populists were provincial, conspiracy-minded, and had a tendency toward scapegoatism that manifested itself as nativism, anti-Semitism, anti-intellectualism, and Anglophobia. 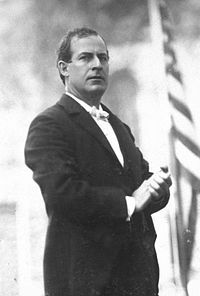 The antithesis of anti-modern Populism was modernizing Progressivism according to Hofstadter’s model, with such leading progressives as Theodore Roosevelt, Robert La Follette Sr., George Norris and Woodrow Wilson pointed as having been vehement enemies of Populism, though William Jennings Bryan did cooperate with them and accepted the Populist nomination in 1896. Michael Kazin’s The Populist Persuasion (1995) argued that Populism reflected a rhetorical style that manifested itself in spokesmen like Father Charles Coughlin in the 1930s and Governor George Wallace in the 1960s. Goodwyn (1976) and Postel (2007) reject the notion that the Populists were traditionalistic and anti-modern. Quite the reverse, they argue, the Populists aggressively sought self-consciously progressive goals. Goodwyn criticizes Hofstadter’s reliance on secondary sources to characterize the Populists, working instead with the material generated by the Populists themselves. Goodwyn determined that the farmers’ cooperatives gave rise to a Populist culture, and their efforts to free farmers from lien merchants revealed to them the political structure of the economy, which propelled them into politics. The Populists sought diffusion of scientific and technical knowledge, formed highly centralized organizations, launched large-scale incorporated businesses, and pressed for an array of state-centered reforms. Hundreds of thousands of women committed to Populism seeking a more modern life, education, and employment in schools and offices. A large section of the labor movement looked to Populism for answers, forging a political coalition with farmers that gave impetus to the regulatory state. Progress, however, was also menacing and inhumane, Postel notes. White Populists embraced social-Darwinist notions of racial improvement, Chinese exclusion and separate-but-equal. Some Populists believed that Jews made up a class of international financiers whose policies had ruined small family farms, they asserted, owned the banks and promoted the gold standard, the chief sources of their impoverishment. Agrarian radicalism posited the city as antithetical to American values, asserting that Jews were the essence of urban corruption. 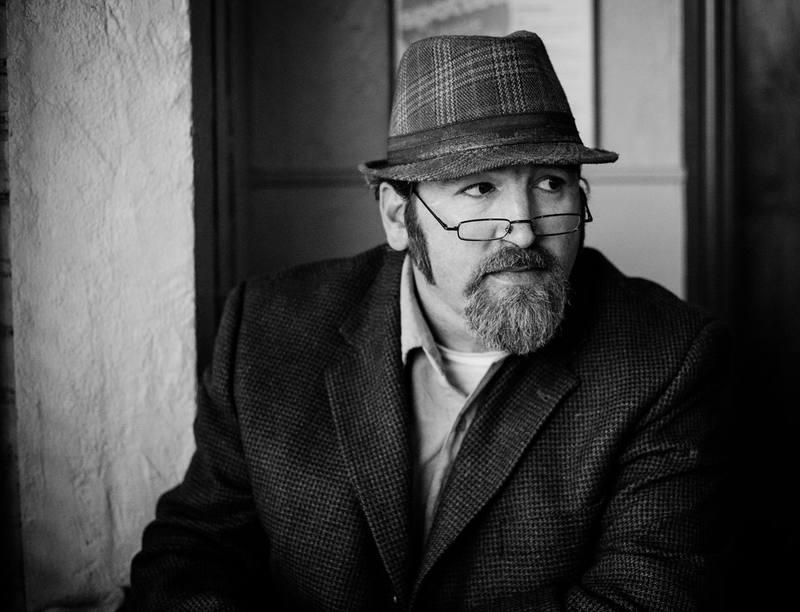 Schwantes, Carlos A. (1976). Left-wing Unionism in the Pacific Northwest: A Comparative History of Organized Labor and Socialist Politics in Washington and British Columbia. University of Michigan – Labor Unions. p. 180. Retrieved 7 February2018. “Oxford English Dictionary”. Oxford English Dictionary Online. 1989. Retrieved 16 March 2018. Foner, Eric (2005). Give Me Liberty! An American History, Volume Two Second Edition. W. W. Norton & Company, New York, London. Gusfield, Joseph (1963). Symbolic Crusade: Status Politics and the American Temperance Movement The University of Illinois Press, Urbana, Chicago & London, p. 78, 93. “Egad! He Moved His Feet When He Ran”. 2008-07-05. Retrieved 2018-09-10. Walter Lippmann, A Preface to Politics, New York and London: Mitchell Kennerley, 1913, p. 275. For a summary or how historians approach the topic see Worth Robert Miller, “A Centennial Historiography of American Populism.” Kansas History 1993 16(1): 54-69. Martin Ridge, “Populism Revolt: John D. Hicks and The Populist Revolt,” Reviews in American History 13 (March 1985): 142-54. Goodwyn, Lawrence (1976). Democratic Promise: the Populist Moment in America. Oxford University Press. Hasia R. Diner (2004). The Jews of the United States, 1654 to 2000. U. of California Press. p. 170. Ali, Omar H. (2010). In the Lion’s Mouth: Black Populism in the New South, 1886-1900. University Press of Mississippi. Argersinger, Peter H. (2015) . Populism and Politics: William Alfred Peffer and the People’s Party. University Press of Kentucky. Beeby, James M. (2008). Revolt of the Tar Heels: The North Carolina Populist Movement, 1890-1901. University Press of Mississippi. Berman, David R. (2007). Radicalism in the Mountain West, 1890-1920: Socialists, Populists, Miners, and Wobblies. University Press of Colorado. Clanton, O. Gene (1991). Populism: The Humane Preference in America, 1890-1900. Twayne Publishers. Durden, Robert F. (2015) . The Climax of Populism: The Election of 1896. University Press of Kentucky. Formisano, Ronald P. (2008). For the People: American Populist Movements from the Revolution to the 1850s. University of North Carolina Press. Goodwyn, Lawrence (1978). The Populist Moment: A Short History of the Agrarian Revolt in America. Oxford University Press. Hackney, Sheldon, ed. (1971). Populism: the Critical Issues. Little, Brown. Hicks, John D. “The Sub-Treasury: A Forgotten Plan for the Relief of Agriculture”. Mississippi Valley Historical Review, Vol. 15, No. 3 (Dec., 1928), pp. 355–373. in JSTOR. Hicks, John D. The Populist Revolt: A History of the Farmers’ Alliance and the People’s Party Minneapolis, MN: University of Minnesota Press, 1931. Hild, Matthew (2007). Greenbackers, Knights of Labor, and Populists: Farmer-Labor Insurgency in the Late-Nineteenth-Century South. University of Georgia Press. Hunt, James L. (2003). Marion Butler and American Populism. University of North Carolina Press. Jessen, Nathan (2017). Populism and Imperialism: Politics, Culture, and Foreign Policy in the American West, 1890-1900. University Press of Kansas. Kazin, Michael (2006). A Godly Hero: The Life of William Jennings Bryan. Knopf. Kazin, Michael (1995). The Populist Persuasion. Basic Books. Knight, Peter (2003). Conspiracy Theories in American History: An Encyclopedia, Volume 1. ABC-CLIO. Lester, Connie (2006). Up from the Mudsills of Hell: The Farmers’ Alliance, Populism, and Progressive Agriculture in Tennessee, 1870-1915. University of Georgia Press. McMath, Jr., Robert C. (1993). American Populism: A Social History 1877-1898. Macmillan. Nugent, Walter (2013). The Tolerant Populists: Kansas Populism and Nativism (2nd ed.). University of Chicago Press. Palmer, Bruce (1980). “Man Over Money”: the Southern Populist Critique of American Capitalism. University of North Carolina Press. Peterson, James. “The Trade Unions and the Populist Party,” Science & Society, vol. 8, no. 2 (Spring 1944), pp. 143–160. In JSTOR. Pollack, Norman (1976). The Populist Response to Industrial America: Midwestern Populist Thought. Harvard University Press. Postel, Charles (2007). The Populist Vision. Oxford University Press. Rogers, William Warren (2001) . The One-gallused Rebellion: Agrarianism in Alabama, 1865-1896. University of Alabama Press. Stock, Catherine McNicol (2017) . Rural Radicals: Righteous Rage in the American Grain (2nd ed.). Cornell University Press. White, Richard (2017). The Republic for Which It Stands: The United States During Reconstruction and the Gilded Age: 1865–1896. New York: Oxford University Press. Woodward, C. Vann (2016) . Tom Watson: Agrarian Rebel. Pickle Partner’s Publishing. Gompers, Samuel (July 1892). “Organized Labor in the Campaign”. The North American Review. 155 (428): 91–97. Retrieved 2006-10-09. Dolph, Senator Joseph N. (January 1893). “Does the Republican Party Need Reorganization?”. The North American Review. 156 (434): 54–61. Retrieved 2006-10-09. Peffer, Senator William A. (December 1893). “The Mission of the Populist Party”. The North American Review. 157 (445): 665–679. Retrieved 2006-10-09. Lewelling, L. D. (January 1895). “Problems Before the Western Farmer”. The North American Review. 160 (458): 16–21. Retrieved 2006-10-09. Stahl, John M. (September 1896). “Are the Farmers Populists?”. The North American Review. 163 (478): 266–276. Retrieved 2006-10-09. Trent, W. P. (January 1897). “Dominant Forces in Southern Life”. The Atlantic Monthly. 79 (471): 42–53. Retrieved 2006-10-09. Turner, Frederick J. (April 1897). “Dominant Forces in Western Life”. The Atlantic Monthly. 79 (474): 433–443. Retrieved 2006-10-09. Peffer, Senator William A. (January 1898). “The Passing of the People’s Party”. The North American Review. 166 (494): 12–24. Retrieved 2006-10-09.